Eye On Sports Media: ESPN's Sam Gore and Author Tom Clancy - Separated at Birth? ESPN's Sam Gore and Author Tom Clancy - Separated at Birth? Tom Clancy, best-selling author of the Jack Ryan series of spy novels, and ESPN play-by-play commentator/anchor Sam Gore share some unusual things in common. Both sold insurance (pronounced IN-surance here in the south) before moving on to major media careers. One wrote books and told stories, the other tells stories on the air. One went on to build an empire worth millions, and one works for an empire worth millions, if not billions. You can probably guess which one is Gore. I had a chance to talk to Sam Gore before yesterday's ESPNU broadcast of the women's basketball game between the eighth ranked University of Georgia Lady Bulldogs (16-0, 3-0 SEC) and the University of Florida Gators (9-7, 201 SEC). I asked him if he was still working Professional Bill Riders (PBR) events. He said no, that that was something ESPN did for one season. 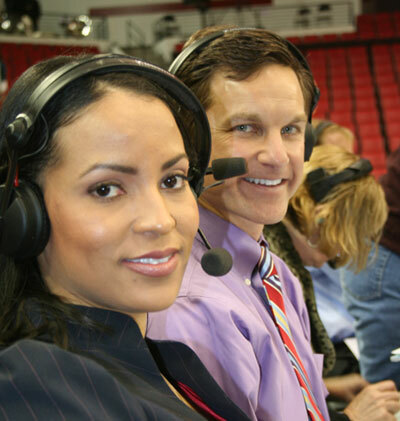 Calling the Shots: ESPNU Play-by-Play Sam Gore (right) with analyst Stephanie Ready after the January 10, 2010 ESPNU broadcast of the Florida - Georgia women's basketball game. Eye on Sports Media/2010. In asking him how tough it is to work PBR events, he said it was incredibly tough. "Bull riding fans are like NASCAR fans. They are very intense and extremely knowledgeable," said Gore. "You have to know your stuff. If you do not do your homework before you go on the air and say something wrong, you will hear about it quickly and loudly. In fact, I had to be approved by the PBR before officially getting the assignment." I was going to do a longer interview with Gore later on this month. But then I found this interview released by the PBR in August 2008 which pretty much covers what I would have asked him. So instead of re-inventing the wheel, here is the interview they published with the graduate of the University of North Carolina at Chapel Hill. Question: For those who don’t already know you, give us a quick summary of your broadcasting career. Answer: Well, at the moment, I’m under contract with ESPN and basically I do the sport of tennis year-round, and then I call whatever major college sport is in season, such football, volleyball, soccer, basketball, softball, etc. Then I also do some work for the Tennis Channel, and that basically keeps me busy year-round. Q: It would be a mistake to think you started at ESPN. Everyone has those steps that they take. What steps did it take to get to this point? A: I’m a play-by-play guy, and basically a major network doesn’t want their play-by-play guy until they’re between 35 and 40 years old. If you watch a major sporting event, you’ll see that the play-by-play guy is usually an older gentleman or woman in the booth. You can’t just come out of college and go to work as a play-by-play guy at a network. What I did was I got a job in the insurance industry working for a company that insured auto dealerships all over the country, which allowed me to have flexibility, and I started calling sports however I could. I did a lot of work in the south at UNC-Wilmington. I called all their basketball games for several years, which then led to regional coverage. It’s just a snowball effect, until finally in 2004 I had a big enough resume and had made enough contacts that ESPN decided they wanted me as part of their family, so I signed a contract, left the insurance business for good and have been a fulltime ESPN commentator since 2004. If you want to be a play-by-play guy it’s usually a pretty long road to get to the network level. Q: A lot of times, broadcasters are associated with one sport or another, but in your case is it fair to say you’re associated with a particular network, which gives you the freedom to have a broad range of events? Q: How did you come to be involved with the Team Shootout? A: Basically it sort of came together like everything else in television, it seems like it’s who you know. A good friend of mine was part of the company producing the events for the PBR and they were looking for the announcers and I popped into his brain because I was the right look and the right style of commentator that he knew he wanted on this sport. I basically have a reputation of approaching every sport I do with a lot of passion. I love what I do and I consider it a privilege, not a right. Therefore, when I’m involved in a sport, they know they’re going to get 100 percent. I think when you’re involved in a sport like bull riding, typically, people who watch that sport are passionate about it too. You need your commentators to be as into it as the fans, and not just picking up a paycheck. That’s why I popped into the producer’s mind when it came time to pick the play-by-play guy, just because he knows I’ll enjoy whatever sport I’m calling. Q: You and I spoke before about, should I call it, your “audition,” and you had an interesting response which I thought was a huge compliment for the PBR. Care to share those thoughts? A: Normally when I get asked to do a sport, it’s a done deal. They will say we need you to call this volleyball match or we need you to call this college football game. This, however, was a different situation. What impressed me was that the PBR, when selecting the announcers, wanted to approve those announcers. When this particular producer contacted me, he said I have something I want you to do, but I have to get them to sign off on it. I think you’re the right guy, but ultimately it’s their decision. So what I had to do, basically, was submit tapes of my work in the past, and because I really enjoy bull riding and this was something I wanted to do outside of what I normally do, I wrote Randy Bernard a letter along with my tapes. I told him about me and the passion I would have for the sport and what I thought I would bring to the shows, and thankfully whatever he saw was good enough for him to give me the thumbs up. Q: Having never announced a bull riding event, how did you go about preparing for this assignment? How much time does that take, and where do you even begin the process? A: Fortunately, my process began at home – I married a Texan. I know that bull riding is not considered rodeo at the PBR level, but my wife grew up in Texas and rodeo was a team sport in her high school, so when she found out I was going to be calling bull riding she jumped right on it. She got me fired up even more and started telling me all about her experiences with bull riding growing up in Texas. So basically what I did was I just started the research process. I would contact people that I knew that were involved in the sport, every night I would just read as much as I could, I had the people that were going to be producing the events send me as many of the Versus shows as they could – just so I could saturate myself with watching the sport and not only watching it but seeing how it’s called by other commentators. That was my process – I just tried to saturate myself with bull riding for about a month until I felt like I had a good enough handle that I could go on air and sound at least like I know what I’m talking about. Hopefully this is going to continue into next year and J.W. has already set me up with a couple of guys to try to go visit on their ranch at the end of the season just to be around them. That’s my next step –to go to a couple of ranches and hang out with these guys and find out firsthand about the sport, not just through talking with people. Q: That’s a great point, and one that I’m sure not everyone thinks about. Not only do you have to familiarize yourself with the sport, but you also have to develop chemistry with your partner in a relatively short period of time. Talk about your working relationship with J.W. Hart. A: I think as a play-by-play guy in any sport – one thing I’ve learned – is that if you can go to an expert like J.W. Hart and you humble yourself before them and say, look, I’ve been given this opportunity to be involved in your sport. It’s a sport that I greatly admire, and one that I think I would have a lot of passion for, but I need the knowledge. I need you to tell me what not to say. I need you to tell me what to say and I need you to just educate me in the sport, and I’ve never had an athlete in a particular sport be offended by that or say they don’t want to take the time to do it. Most people who are at the professional level are passionate about that sport and want everyone else to be. When you humble yourself and say, look I don’t know it all but I want to know it all, then a guy like J.W. Hart is going to jump in there and educate you as well as he can. J.W. in particular is great to work with because he’s very laidback. He doesn’t have a quick temper and he’s not impatient. He’s just a dream, really, to work with, especially for someone who is trying to become an expert in a sport like the PBR where your fans are – I don’t want to compare them to another sport, but I would say they’re probably similar to NASCAR – in that the people that watch this sport have been watching it for a long time and are very knowledgeable about the ins and outs of it. Q: Once it was time to do it for real, how did it go? A: It went great. Fortunately I had learned enough in the time I was given before we started taping the shows that I felt like I had a command on what was going on and why it was happening. J.W. is so knowledgeable that it’s easy for a play-by-play guy like me to set him up, because I don’t have to go into a lot of detail setting him up. I can sort of ask a leading question and then he takes it and runs with it. It worked out very well and I thought we had very good chemistry. I look forward to working with him a lot in the future. Q: You already spoke about the passion of our fans. What do you do to win them over or to be accepted? A: If I had the magic answer for that I think I would probably be doing something else. The important thing you do as a commentator is love what you’re doing. If you’re really into the sport that you’re calling, your fan base that is a part of that sport is going to know that, and they’re going to pick up on that. I try to call sports and bull riding in particular with the idea that I’m sitting on the couch at home with a friend, what are we talking about? It’s just a couple of guys or my wife and I, what do they want to know that I can tell them? Hopefully the PBR fans will see the passion I have for the sport and that my knowledge will match that. Q: Of all the sports you’ve covered and all the events you’ve been to, it’s kind of ironic that you can share this experience – bull riding – with your wife. A: Yeah, it’s been great. It’s really allowed her to feel like she’s not just supporting me in my career, but also helping. I really did have to lean on her with this assignment. A: One thing I wanted to point out that’s been so refreshing is that I’ve called sports at the professional level and the collegiate level, and the thing that has sort of set the PBR apart for me has been the integrity of the riders. I’ve been blown away by the type of men they are. You see these guys out there riding bulls and you’re thinking these guys are crazy, but when you talk to them there’s a lot of substance with these guys. They’re very full of integrity and character. That’s really impressed me because, I guess, I’m used to dealing with professional athletes that are pampered and handed everything. These guys are not at the beginning stages of the sport, but I think they’re on the cutting edge of this sport going huge and it makes me very happy to see a sport with good people in it, and that’s what’s sort of set this sport apart is just the depth of people that are riding these bulls. It’s so unique and refreshing to me that if you don’t perform, if you don’t win, then you’re going home with an empty pocket. I mean, these guys are riding for their paychecks, and if they don’t make their ride, placing in the event, then they’re not making any money. You don’t find that in too many professional sports these days. It’s fun for me to see a sport that still does it that way. You would think it would be a cutthroat sport – it’s every man for himself – but I’ve been impressed with the fact that they have to show up and they have to perform to get paid, but at the same time they’re in the chute with each other, pulling their ropes, they’re helping each other out, and there’s just a lot of old-fashioned camaraderie and character.